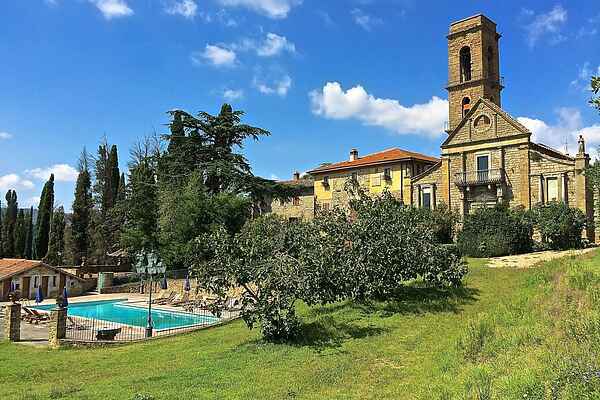 A long driveway lined with century old cypress trees leads to this beautiful country villa with private chapel and a tower. The most ancient part dates back to the Middle Ages, but the building has been enlarged and transformed several times. It's been in possession of the current owners for centuries now and is the hearth of a farm estate producing Chianti wine from the Arezzo hills and olive oil (both can been purchased). Surrounded by wonderful cypresses, cedars and a gorgeous pine tree, the property boasts a peaceful position with wide views over the Chiana valley and hills including the castle of Gargonza. An attentive restoration has put in evidence the original ceilings with beams and bricks, stone walls, floors in stone and bricks, antic stone fireplaces. Our private hill sits in a peaceful atomosphere surrounded by lush vegetation including cypresses , cedars of Lebanon , vineyards and olive trees . Nearby there are many activities to do such as going to visit medieval villages in Val di Chiana where you can taste excellent Chianina meat and local flavors. Horse riding , golf and fashion outlets in 20 minutes , 30 minutes Outlet Prada . Monte San Savino 5 minutes , 20 min Arezzo , Cortona 30 minutes , 40 minutes Montepulciano , Florence and Siena 45 minutes , Perugia , Assisi and Orvieto 1 hour .